A Lyft driver was and six others were seriously injured in a car accident in late March that occurred on Southwest 17th Street and Southwest 25th Avenue in Miami. A Volkswagen Jetta belonging to the Lyft driver and a BMW collided with each other at the intersection. This collision sent the vehicles skidding into a front yard, according to local10.com. The driver of the Jetta died at the scene of the accident. In addition to the Lyft driver losing his life, two women and four men ranging in age between 25 and 35 had to be transported to Jackson Memorial Hospital’s Ryder Trauma Center for treatment of their injuries. Their injuries range from broken bones to head trauma. During the investigation into this awful accident, it was discovered that the driver of the BMW was in possession of three bags of suspected crystal meth prior to the crash. The BMW he was operating was also reported as stolen, according to ABC10. The driver of the BMW was arrested and charged with grand theft of a vehicle and possession of a controlled substance. One of the most traumatic and gut-wrenching events in anyone’s life is learning that a loved one has passed away. The pain is only made worse when it is revealed that the death was sudden and caused by another driver’s careless or reckless behavior. As of this writing, it is unclear of the exact cause of the accident. Nevertheless, the fact that the BMW driver was operating a stolen vehicle and potentially on crystal meth may mean that they negligently operated the vehicle and caused the collision with the Lyft driver. As mentioned, the BMW driver is currently facing criminal charges, but he can also be held responsible in civil court through a wrongful death lawsuit. The family of the Lyft driver should consider speaking to an experienced wrongful death attorney to discuss their legal options. Surviving blood relatives (but only if they were partially dependent on the decedent prior to their death). 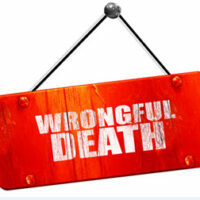 There is a limited amount of time to file a wrongful death lawsuit in Florida civil court. Under Florida law, the statute of limitations for a wrongful death claim is two years from the date of the victim’s death. If you attempt to file a lawsuit after two years, your case will likely be dismissed by a court. This means time is of the essence and you should speak to a lawyer sooner rather than later. The Miami law offices of Alan Goldfarb, P.A. is ready to help you and your family during this difficult time. We are an AV-rated law firm by Martindale-Hubbell. This rating means we are respected in the legal community. Contact our firm today to schedule a free consultation.